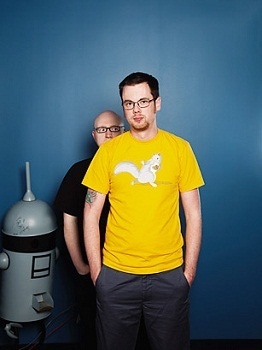 Penny Arcade co-creators Jerry Holkins and Mike Krahulik can now call themselves the 14th most influential artists in the world. This year, Time broke its list of the 100 Most Influential People into four categories: Heroes, Leaders, Artists, and Thinkers. While Holkins and Krahulik could've arguably landed in any one of those, Time placed them in the Artists group. In addition to the duo's accomplishments with the charity Child's Play, which currently serves more than 60 hospitals nationwide, and the creation of Penny Arcade Expo, a celebration of gamer culture that draws tens of thousands of guests to both the East and West iterations, Time acknowledged the staggering influence they have in the gaming culture. "Krahulik and Holkins have become the tastemakers, and conscience, of an industry the size of Hollywood," Time writer Lev Grossman said. "But for all their success, they are almost compulsively self-deprecating, and they give all the credit to their fans. You can't put a label on them. Labels smack of hype, and Penny Arcade doesn't do hype." Whether you love or hate Penny Arcade, it's hard to deny its influence in the gaming world. Who knew two gamers on a couch, a drunken Xbox 360, and a machine that horrifically violates fruit could be so powerful?